The beta version of the States Assembly website is nearing completion. We have added plenty more pages for users to try out at: https://beta-statesassembly.gov.je and we are just starting development on the remaining pages before we go live. One of the main things we wanted to achieve as part of the website refresh was the migration of Scrutiny content onto the States Assembly website to make it easier for users to find Scrutiny reviews and reports. For the first time, users can now access Scrutiny content from the States Assembly site with our new Scrutiny homepage. The Scrutiny homepage includes the latest Scrutiny news and features our new calendar function which details all of the meetings that are coming up. One of our favourite features on the page is the count-up of the number of ongoing reviews, the number of reviews open for submission and the number of reports issued by Scrutiny in the last 12 months. The Scrutiny reviews and Scrutiny reports pages have a new look that ties in with the new search pages across the site. We are also working on improvements to the search function across the entire site so that it is easier for users to find what they are looking for. We have added a ‘witness’ field to the Quarterly Hearing and Review transcripts pages so that users can search transcripts by witness. The Scrutiny team are now going through all of the old transcripts populating the witness field so that users will be able to benefit from this function. 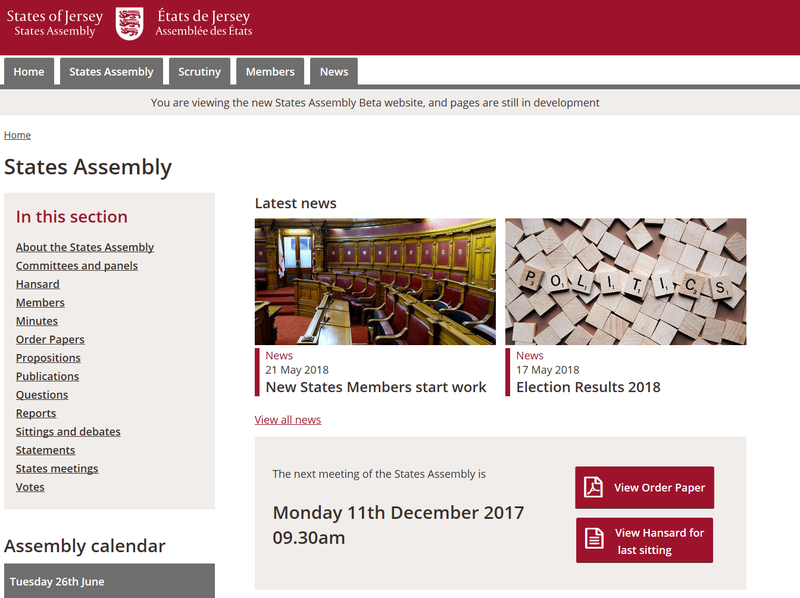 We have a new homepage for the States Assembly which features news stories and displays the date of the next States sitting in a prominent location where you can also view that sitting’s Order Paper and the Hansard of the last sitting. We’ve taken into account the views of stakeholders and page analytics and provided two search areas on the homepage which allow users to look for documents and States members without needing to go to the relevant pages. We have also made it easier to find the link to webcasts of States sittings so that users can go straight to the most recent sitting and watch the debate. The new calendar function has been applied to both the Scrutiny and States Assembly areas of the site. Once we have our new homepage, it will feature a merged calendar showing meetings for both the States Assembly and Scrutiny. The current ‘Sittings and debates’ page is going to be replaced by the calendar function. Users will be able to add Scrutiny and States Assembly meetings to their calendars and view all of the items that are scheduled for debate at forthcoming States sittings. They will also be able to download meeting agendas from the calendar function. We haven’t yet developed the full calendar page, but that is coming in the next sprint. 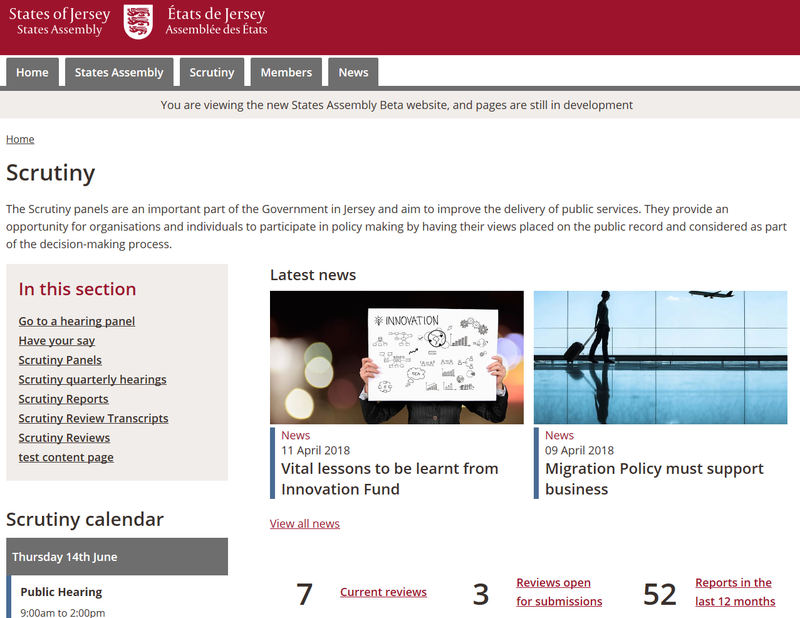 We have always been able to publish Scrutiny news, but whenever we have had States Assembly news to announce we have had to upload a document to the ‘What’s New’ sidebar on the States Assembly homepage. 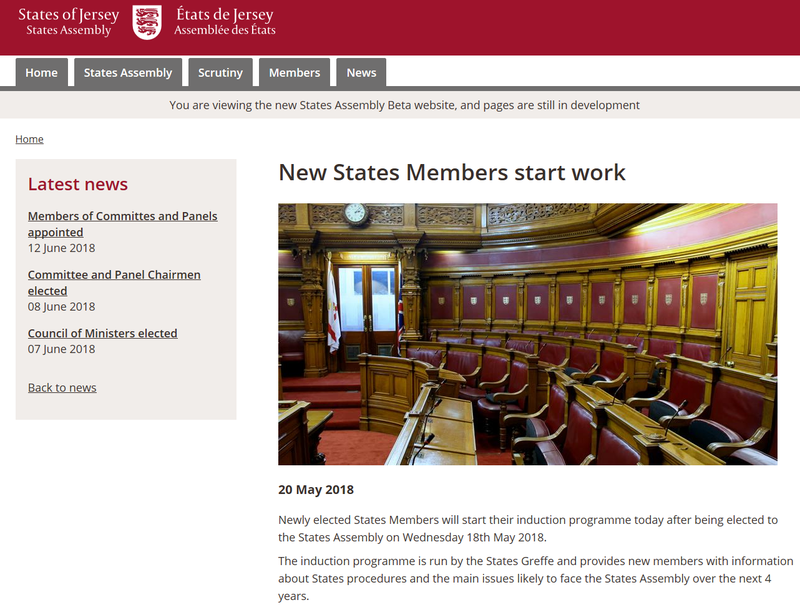 A key element of our plans for the website refresh was the introduction of a news page for the States Assembly. Now we are able to publish news stories that appear on the homepage as well as the Scrutiny and States Assembly news pages. Please give us your feedback on the beta site using the smiley faces in the bottom right-hand corner of each page. We also need volunteers to help with testing the new site to achieve the best user experience. If you currently use the site as part of your job and can spare half an hour to go to Jubilee Wharf please contact Amber James or call +44 (0) 1534 440490.